Starting today I will begin posting my trip on my blog as I find Facebook to be too unwieldy. I'll always post a link to the blog and hope it works. I'd appreciate hearing from someone to make sure the link is working. Today is the beginning of my 70th year. A big deal no matter how you look at it. No matter who's looking. It's hard to avoid musing on the past and the future. Not in an ordered way, but rather as the musings come to me. I try to avoid the math describing the difference between my current age and the age of my father at his death--96. The likelihood of living beyond him is slim. And the likelihood of living to his age is daunting. I'm working on a new mantra, though. Maybe "Soak it up." That is, learn all that I can. Feel the colors. Taste the wind. Eat the cheese. Make merry whenever. And weep with abandon. I have read and re-read a piece written by Roger Cohen in the December New York Times that resonates with me even more fiercely today. He wrote, "Death is the shadow that gives shape to existence, urgency to love, brilliance to life." This is my plan: Love urgently. Live brilliantly. Our youngest son, Sam, works at the Sacramento Zoo with animals in the Interpretive Center (IC), which include, generally, animals not able to be on display in the regular part of the Zoo, but many of which are shared with the public through walks around the Zoo or shows in their little theatre. Here's a picture of Sam with the Eclectus and the Thick-Billed Parrot. He has worked at the Zoo since he was 14, starting as an intern and, when he turned 18, as an employee. After completing his degree, he began working full time. He's been bitten and scratched and wounded in all sorts of ways, but I haven't had real cause to worry about his job in all that time (13 years)--until now. And here he is showing my visiting cousin the Armadillo. This little guy is as cute as can be. Awww. But Hedgehog habits aren't so cute. Notice Sam is holding him with a glove (OK, to protect himself from the spines) and a towel. Well, never mind that. Last night at dinner, our conversation wandered onto the subject of venomous snakes. How we arrived there, I can't remember. But as he explained all about who makes antivenin, how much it costs, how long it lasts, even where it is stored at the Zoo, I said, "You seem to know a lot about the antivenin at the Zoo. There aren't venomous snakes in the IC, are there?" "No," he assured me. "Are there venomous snakes in the Reptile House?" "Yes," he said. "You don't handle those, do you?" "Yes, I do." "But not with your hands?" "No," he said, shaking his head. "Just with snake sticks." Now I don't have an inordinate fear of snakes. He left his snake in an enclosure in our family room when he moved out. And I don't mind him. He doesn't smell. He doesn't bark. He's boring, but pretty self contained. And since the snake wasn't handled much when he was younger, he will bite, so I don't ever touch him. And anyway, Sam's forced to come home for a visit every so often to feed him. Venomous snakes are in another category. Those I fear. Now I've watched Sam handle the snake with his snake sticks and I wasn't overly comforted by his suggestion that he doesn't use his hands at the Zoo. When he feeds his snake here at home, he moves him from his enclosure to another container. And that snake has a way of slithering right off those sticks and suddenly, there he is on the floor. Sometimes mothers can be over-informed. Last evening, Max really wanted to go outside after dark. Usually I can dissuade him by inviting him onto my lap. This time, he didn't seem open to such dissuasion. As a result, quite methodically, he used his paw to gracefully swipe item after item from the coffee table by my side. And one by one, I picked them up and put them back on the table. The pencil, the pen, the little tablet, the French grammar book, the tissue box, the iPad. One by one by one. And finally, the iPhone. I didn't give it a lot of thought as the iPhone has fallen to the floor many times from a greater height without adverse consequence. This time, however, it landed precisely on the corner and the front crystal cracked--big time. So today, I've been forced to handle the phone very carefully. The cracks are growing and it actually seems as though there is moisture under the glass. So I am having to implore Siri to help me more than I'm used to and have left the phone on the counter instead of carrying it around in my pocket. With each iteration of cell phone comes more technological dependence and today's incident demonstrates my growing reliance on the convenience. I stepped outside this evening to enjoy some time under the elm tree in the breeze and peruse the Michelin green guide to Provence. At least six times I moved my hand automatically to grab the phone (which wasn't there) to look up a word in the dictionaries--both French/English and Webster's, search for more information on something I didn't know about, look up a spot on the map. Pre-phone I had no trouble doing this kind of research without the convenience of the phone by making a note (using an archaic pen) and then consulting the atlas, my maps, the dictionary, even the modern computer. I find myself relegated to the ranks of the young, which could in other circumstances be quite a compliment. But I'm a little ashamed for so heavily relying on something others mock on Facebook, Comedy Central, the late night shows, cartoons, and other media--all available on the iPhone. Later this week, I'll be exchanging my phone for an upgraded device because while I respect the value of an old-fashioned hunt for the answer, I have grown accustomed to instant virtual information. Max, on the other hand, would like me to stop focusing my attention on anything but him. As I write this, Max is sitting to the left of the keyboard occasionally swiping at the letters as they populate the screen. He's a sweetheart of a cat, but really, Max, must you? I believe others consider me predictable. I'm not unkind. I know the napkin and fork go to the left of the plate and the knife and spoon to the right--knife on the inside, of course, blade toward the plate. I treat our animals well. I'm usually good for a laugh when the meeting gets tense. I communicate well both verbally and in writing. I'm fussy about my coffee. My drink of choice is gin--unadulterated. I love to eat. I always glance at the river--whatever river that might be--when I pass over a bridge. My friends can count on me in a pinch. I love my family with all my heart. So now that I've reached the advanced age of over 65 (no need to be specific) having acted mostly responsibly my entire life, I've decided today to go blue. Blue nail polish, that is. After all, what's the use of maturity if you can't act unpredictably once in a while? From time to time in the last several months, I find myself suddenly overcome with a feeling of "le bonheur" or "happiness." I can't really explain it and I especially can't ever explain the timing of these feelings. I might be walking around the block, which actually is an understandable venue. But it happens just as often when I'm sitting in front of the t.v. watching the news--the bulk of which is stressful, anxiety producing, makes me angry or at least annoyed, fills me with sorrow, and rarely makes me feel good. And sometimes I'm stuck in traffic watching the light turn red and green and red and green while I sit with my foot on the brake. Or in a more understandable moment, I'm at the table with my boys enjoying a meal. It simply strikes uninvited, but most welcome, at the strangest times. I wonder if I am undergoing some kind of metamorphosis--some physical change in the structure of my brain. Or is it that I've reached a point in my life when I can compartmentalize any frustration or sadness in a way that shuts it down before it can grab my soul. I'm not fighting it. I'm enjoying it. But I cannot really understand it. And I don't remember ever having this kind of intense and sudden feeling out of the blue. I still ponder morbid thoughts about the endless possibilities that could befall me--especially just as we're ready to leave for France in the fall. But these newfound deep feelings of elation and happiness are a welcome respite. I'm counting on them to comfort me through the drudgery of the already-proving-to-be rancorous presidential campaign, the despair reported about people's lives on the news, the ever-worsening climate change, concern for the ubiquitous terrorist violence, ad infinitum. I chose "le bonheur" as my companion any time it drifts my way. Today is my first Father's Day without a father of my own. It's just one more opportunity for me to conjure up some good memories. And that's easy to do. Recently, I came across Dad's hand-written Ten Commandments and sent them to my siblings. My brother, of course, reminded me of the original fifteen, and Dad would have loved the association with Mel Brooks. Here are Dad's Ten. And if anyone lived by these, he did. He never passed up an opportunity to sit down with someone whose views he may not have shared prepared to be persuaded--but only if the other point of view somehow worked better for him. And listen he did--always respectfully, I might add. 1. Thou shalt open thine eyes to perceive the "round about." 2. Thou shalt create meaning. 3. Thou shalt care deeply and lovingly for thyself. 4. Thou shalt have care and compassion for all other "thous." 5. Thou shalt learn the rules which enable life to be corporate so that creatures may survive. 6. Thou shalt sing and laugh and take great pleasure. 7. Thou shalt be with others for others without "using" them against their interests. 8. Thou shalt gather together with those who share similar attitudes and meanings to reinforce thine own. 9. Thou shalt gather with others who differ from thee to learn from them. 10. Thou shalt create visions of great good. Dad was one of a kind. He will always be remembered. 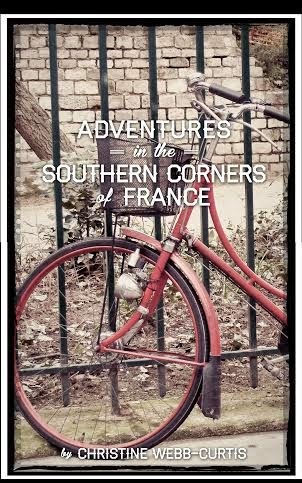 Join me on my adventure across the south of France--the food, the folly and the joy of La Belle France. To purchase my new book in paperback, go to CreateSpace or to Amazon. To purchase my new book in digital version, go to Amazon. To purchase my first book, you can find it in paperback at CreateSpace. To purchase my first book for the Kindle, you can find it at Amazon. 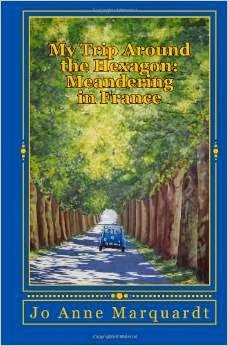 Check out the book of my friend and painter, Jo Anne Marquardt, also available at Amazon. Visit Shutterfly to see our Portugal photos from a 2008 visit. Enjoy the trip! Interested in learning another language? Lynn McBride has some helpful tips in her book available at Amazon.